Welcome to the first issue of Tracks, the newsletter for the Grizzly-PAW project. Grizzly PAW is a three year, $2.1M NSERC research partnership with four universities and twelve industrial partners. Our research will center on the grizzly bear in the Yellowhead bear management areas of Alberta, Canada. This newsletter will come out three times a year, in January, May and September and will cover the activities and people that are involved with Grizzly-PAW. Dr. Nicholas Coops is the lead researcher of Grizzly PAW. He is a specialist in remote sensing and develops applications of remote sensing to forestry conservation. Dr. Scott Nielsen is a conservation biologist at the University of Alberta. His research focusses on biodiversity conservation. Dr. David Janz is based at the University of Saskatchewan, he is closely associated with the Toxicology Ctnre and focusses on the relationship between stresses and physiological processes. Dr. Chris Darimont is an interdisciplinary conservation scientist at the University of Victoria. His work involves relationships between carnivores and human activities. Gordon Stenhouse is a research scientist and project leader for the fRI Research Grizzly Bear program. 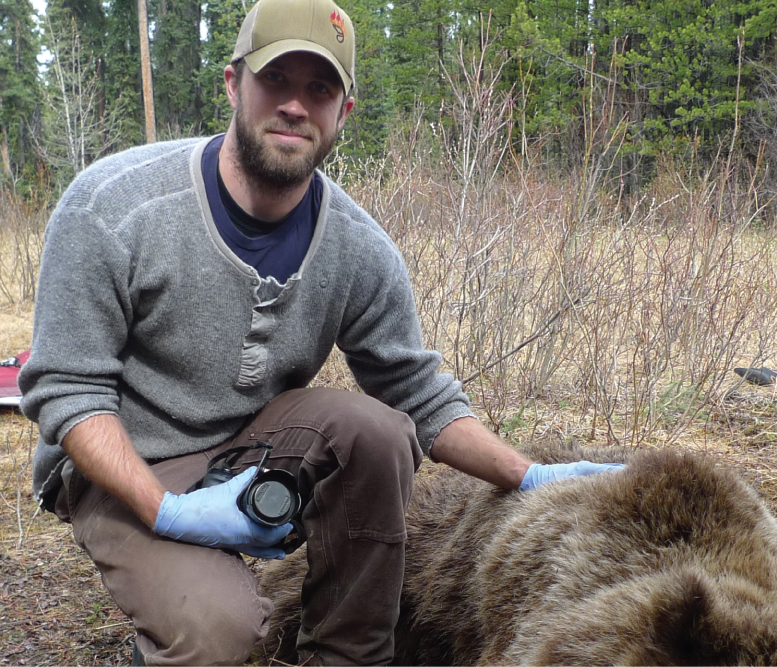 His research has been on understanding the impact of changes in the landscape on grizzly bears. Grizzly-PAW will focus on four areas of research to further our knowledge of the grizzly bear. Disturbance mapping provides key information to address several questions about grizzly bears. This research will use remote sensing to monitor human and non human changes in the landscape, snow cover fluctuations, and road utilization. Research will further the definition and mapping of ecoanthromes and evaluate the use of biodiversity as a proxy to the health of other species. Bears behaviour is influenced by their spatial environment. Tracking bear movements can provide insights into how disturbance, forest structure, human activity and food supply influence their behaviour. Research will study population trends based on data collected over the decade spanning from 2004 – 2014. Research will also evaluate food supply and land carrying capacity as a function of landscape change. Bear physiology can be used to detect issues in individual bear health. Our research will include developing a set of markers to benchmark bear health and follow that with an evaluation of the health of individual bears in relation to their life stage and capture history. I am a PhD candidate in the Spatial Pattern Analysis & Research (SPAR) Lab in the Department of Geography at the University of Victoria. Working with the fRI Grizzly Bear Program, my current research is examining grizzly bear movement in Alberta using GPS data to understand how individuals interact with their environment. I also completed my Masters of Science (MSc), looking at spatial patterns of grizzly bear health, and my Bachelors of Science (BSc) in Geomatics at the University of Victoria. Prior to attending school in Victoria, I obtained my Baccalauréat ès arts (BA) in Psychology from the Faculté Saint-Jean at the University of Alberta. While I’ve always spent a lot of time outdoors, my interest in environmental research is largely a result of the seasonal jobs I’ve had while in school or between degrees. I was a Conservation Officer for three seasons in Dinosaur Provincial Park in southern Alberta, spent five years with the Alberta Wildfire Rappel Program, and have worked with the Parks Canada fire program out of Revelstoke and Glacier National Parks. Some highlights included catching rattlesnakes and bats for population counts, as well as occasionally helping the paleontologists in Dinosaur, working on forest fires in Alberta, BC, Ontario, Montana, and the Yukon, and learning how to rappel from a helicopter. Fire indices maps and satellite imagery, that are an important part of the daily operations in fire management, sparked my interest in Geographic Information Systems (GIS) and remote sensing which led me to attend the University of Victoria. I’ve greatly enjoyed my time working with the grizzly bear program, and having the opportunity to study grizzly bears and contribute to the conservation of the species in my home province has been incredibly rewarding. I’ve participated in a few captures, where the animals are fitted with GPS collars and biological data are collected, and seeing a grizzly bear up close is so impressive! They really are amazing animals. When I’m not writing code, or working on a movement model, I try to spend as much time as I can ski touring, hiking, camping, and biking. I really enjoy trail running and triathlons, basically anything that gets me outside moving. I’ve been lucky to do a fair bit of travelling in Central America, Europe, and Africa, and am looking forward to doing some more with my family once I finish my degree.